Safety stock is defined as inventory that is carried to prevent stock outs and back order situations. Stock outs stem from factors such as fluctuating customer demand, forecast inaccuracy, and variability in supplier lead times. There must be a balance between inventory costs and customer service. One key challenge and an important piece in the puzzle is calculating the basic safety stock levels to achieve your desired customer service levels. Many companies look at their own demand fluctuations and assume that there is not enough consistency to predict future demand variability. To avoid stock outs, backorders and dissatisfied customers safety stock levels must be properly calculated and monitored. Let’s take a look at the most basic safety stock calculation. First, let’s look at the basic safety stock levels calculation. The calculation rule for the standard formula for calculating safety stock assumes a deterministic replenishment time and a stochastic or random consumption within this time. If your lead-time, order cycle time, and forecast period were all the same and if your forecast was the same for each period and equaled the mean of the actual demand for those periods, this simple formula would work great. Since this situation is highly unlikely to occur you must add factors to the formula to compensate for these variations in your supply chain. The basic safety stock calculation is great for simple supply chains that do not have concern about the variability of their demand or supplier lead times. For more complex supply chains, inventory managers must look to more complex calculations such as time based calculations or statistical calculations. 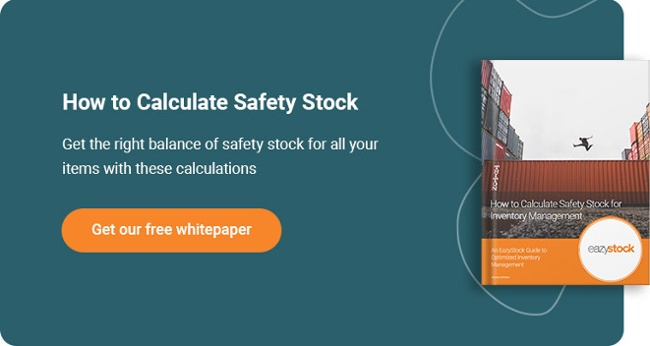 To find out more on calculating safety stock, download your copy of our free white paper that goes into deeper detail on the importance of safety stock and how to determine the best levels for your warehouse.